There is a hidden and deeply unfair "tax" that is costing US savers in excess of $500 billion per year. Through forcing interest rates far below the rate of inflation, the government has effectively created a tax on savings that not only takes all real interest income, but quite deliberately confiscates wealth from tens of millions of savers every year - for the direct benefit of the government. As will be demonstrated with step by step, simple illustrations, the government is imposing the economic equivalent of a 90% income tax on savers. The amount taken annually from savers is equal to more than half of all individual income taxes, and is nearly three times as large as total corporate income taxes. The tax is not uniformly imposed, but instead targets older middle class savers in particular. The effects include invalidating decades of financial planning, and potentially impoverishing millions of current and future retirees. Let's say that you save $1,000 and put it in an interest-bearing checking account (or money market fund) at the bank. The bank or fund takes your money and reinvests it, using your money to buy short term and very high grade securities. It mostly buys either government debt, or other assets where the interest rate that is paid is closely tied to the interest rate on government debt. This means that you and millions of savers like you are the lenders, and the government is the borrower, with the bank acting as middleman. The bank effectively passes the government's interest payments through to you, less a small fee (which we will leave out to keep the illustrations simple). In other words, when we save in a bank or money market account, we are all doing our parts to finance the deficit, because the government is borrowing from us. As savers, we all hope that our savings maintain their value, and maybe even grow a little each year. However, since inflation destroys the value of our money each year, an interest rate at least as high as the inflation rate is needed in order to break-even (pre-tax) and maintain the value of our savings. According to the Bureau of Labor Statistics, the annual rate of inflation through September of 2011 was 3.9%. Therefore, in order to "break-even" we require a 3.9% interest rate. As illustrated above, there are two sides to the transaction, with you as the saver being the lender, and the government being the borrower. When the interest rate is equal to the rate of inflation - neither side comes out ahead. What you would prefer is not 3.9% however, but to make at least enough so that you can come out a bit ahead by year's end. In a free market, rational savers would demand something in the range of a 5.0% rate of return, giving them an annual real (after inflation) profit of $11 on a pre-tax basis. 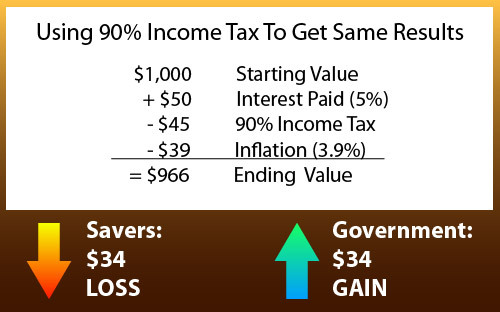 In this illustration, for every $1,000 invested, a saver gets $50 in interest income, of which $39 goes to offsetting inflation, and $11 is left as real income. This relationship is how interest rates are supposed to work according to economic theory: in a free market, savers demand a short-term risk-free yield which borrowers (including the government) are obliged to meet, and because no rational investor would lock in losses by lending money at a rate below the rate of inflation, this short-term yield is slightly above the rate of inflation on a pre-tax basis. And a short-term yield of just a little over 1% over the rate of inflation is very much in the historical range, at least when the government is not suppressing interest rates. As the chart demonstrates, for a saver to come out ahead, it has to come straight "out of the pocket" of the borrowers, including the nation's biggest borrower - the federal government of the United States. 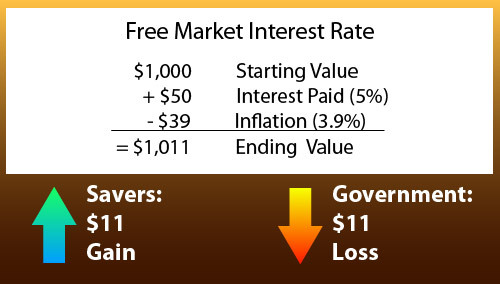 This means that in order for savers to get the small but positive returns which they would demand in a free market, the government as the other party to the transaction must now pay a nominal interest rate of 5.0%, and a real interest rate of $11 per $1,000, or 1.1% on an after-inflation basis. Payment of free market interest rates on $15 trillion in debt would radically increase the federal budget deficit. To avoid this, and for the government as borrower to do better - its gain has to come straight out of the pockets of savers. In the real world there is no free market in interest rates. Indeed, there is nothing even remotely close to a free market, and when it comes to interest rates, the rational desires of savers are demonstrably borderline irrelevant. After all, one of the primary functions of the Federal Reserve has always been to exert near complete control over short term interest rates. Acting on behalf of the government and banking industry, through its policies the Fed has (effectively) decided that 0.5% is a good interest rate for money market accounts and interest-bearing checking accounts (the national average for each was 0.5% as of late November, 2011, per Bankrate.com). No rational saver would voluntarily enter into this relationship of locking in a 3.4% annual loss in purchasing power. But that is the way things are, and as anyone with a money market fund, bank CDs or interest-bearing checking account knows - there is no effective choice. And when we look at the annual increases in such categories as food, fuel, health care, utilities, education and property taxes - there is no doubt that prices are rising rapidly, and even the official 3.9% rate of inflation looks quite understated. Because of the government's own fiscal and monetary policies which create inflation, 3.9% of the value of our money is destroyed, and our $1,000 starting balance by the end of the year is only worth $961. Add in the $5 interest income, and we end up with $966 in real purchasing power. So we lose $34 - and that benefit passes directly to the government, which acts as our mirror. Because the government now only owes $961 in inflation-adjusted terms, it comes out $34 ahead even after paying us our paltry $5 in interest. Our real loss as a saver is necessarily exactly the same as the government's real gain as the borrower (leaving out taxes and middlemen). There is a name for the government using its powers to take money from its citizens: taxation. When the government manipulates interest rates down to well below the market rate, thereby forcing negative returns on an inflation adjusted basis - it is taking wealth from savers just as surely as if it were raising the tax rate on savers. To illustrate this point, let's take a look at what the income tax rate would need to be on savers, in order to generate the same benefit for the government. 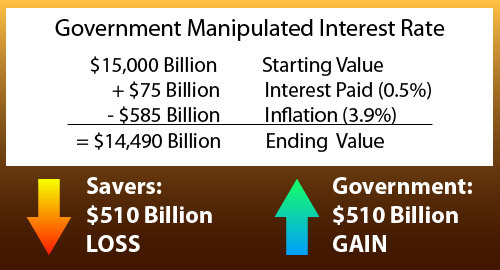 With the manipulated interest rate of 0.5% currently seen with checking accounts and money market funds, the government comes out ahead $34 (3.4%) on every $1,000 borrowed per year. To still end up $34 ahead, after paying a free market interest rate of 5.0% which takes into account the rate of inflation, the government would have to impose a 90% income tax on interest earnings. If the saver pays $45 in taxes on $50 in free market interest earnings, and we then subtract $39 for the purchasing power loss to inflation, the saver ends up with $966 on an after-tax and after-inflation basis, and a net loss in real terms of $34. 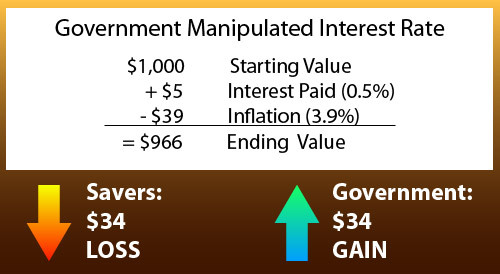 The government acts as the mirror again: paying $50 in interest as borrower, but immediately taking back $45 of that interest income in the form of open taxes that have been passed into law by Congress and the President with the full knowledge of the voters, and dropping the value of debt owed by $39 due to government-created inflation, leaving a net real gain of $34. The bottom line for both savers and the government is identical between the current manipulated interest rates of 0.5% on savings, and the alternative of the government paying a free market interest of 5.0% that fairly compensated savers for inflation - while simultaneously openly imposing a 90% income tax rate on interest earnings. Either way, as shown with the arrows in each exhibit above, the savers lose 3.4% in real terms, and the government gains 3.4%. However, the second alternative would involve openly admitting to the voters what is being done. Honesty would mean tens of millions of retirement investors understanding much of the real reason why they can't retire, or why their lifestyles can no longer be supported. Honesty would mean voters demanding greater fairness in the tax code, so that so much of the burden doesn't fall on the older members of the middle class. Honesty would pose rather grave challenges for incumbent politicians if they have to stand for re-election after openly admitting that they have raised interest income tax rates to 90% and the deficit is still over a trillion dollars a year. While the government admitting to the existence of a 90% income tax on savers could obviously lead to a political explosion, the reality is even worse, for the hidden savings tax is arguably something much more costly than a mere income tax. Even if it were a 100% income tax - then yes, all of our earnings would be taken by the government, but at least we would be able to keep what we started with. 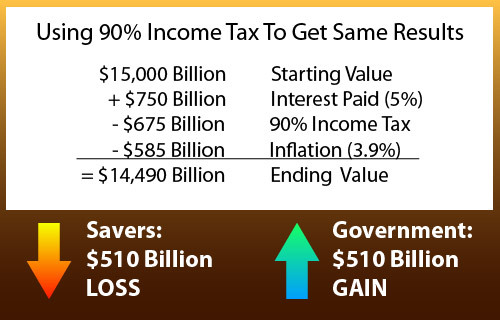 With the hidden savings tax - the saver has negative income instead of zero income, because not only is all income taken, but the government takes a chunk of the value of the asset as well. That is, inflation simultaneously reduces the real value of what the government owes in an amount exactly equal to the reduction in the real value of the savings account. A 3.9% rate of inflation with 0.5% interest rates is the same as a 3.4% rate of inflation with 0% interest rates. This is also the same as no inflation and no interest rate, but the saver just writing a check to the government for 3.4% of their savings every year. The bottom line is the same with each approach: the nation's savers are forced to effectively pay 3.4% of the value of their savings to the government each year, with no real income at all. Thus the hidden savings tax is best described as a straight-up asset tax, at least with regard to the impact on savers. 3) As the nation's largest borrower, the government directly financially benefits from a combination of high inflation and low interest rates. Using its powers in combination, the government pays no real interest, but rather takes 3.4% of the value of savings each year. As will be discussed later in this article, governments' deploying this three part combination to quite deliberately take wealth from savers on a massive scale, year after year, is a well established and historically "successful" policy known to economists as Financial Repression. When we understand this asset tax - then all the smoke and mirrors go away. The government needs money for political purposes. Tens of millions of the most productive people in the nation produce the real wealth that supports the national standard of living, and after paying income taxes, social security taxes, sales taxes and property taxes, they are encouraged to save and use the "miracle of compound interest" to grow their wealth. Except there is no real compound interest and the wealth doesn't grow when the rate of inflation is higher than the interest rate on savings. Negative effective interest rates are just another level of taxation, albeit a hidden level, where the more you have saved after all the other taxes - the more the government takes each year. On a very simple level, if we look at the current total federal government debt of $15 trillion, and say that the average saver is losing 3.4% while the government is gaining the same, then the size of this asset tax is $510 billion. The charts below show the this hidden $510 billion tax on savings in three different ways. If there were a 3.4% asset tax, whereby the government simply took 3.4% of each saver's money each year: then savers would lose $510 billion each year, and the government would gain $510 billion each year. If there were a 90% interest income tax rate on a free market interest rate of 5.0%, which would be appropriate for a nation with a 3.9% inflation rate: then savers would lose $510 billion each year, and the government would gain $510 billion each year. With the existing situation of an official 3.9% inflation rate and 0.5% short-term interest rates, savers do lose $510 billion each year, and the government does gain $510 billion each year, when we look at the size of the total federal debt. The economic bottom line for the government is identical. But the concepts involved are just complex enough that the government has been getting away with it. Of course, savers are very well aware that they are being incrementally impoverished each year as interest rates fail to keep up with inflation. How could they not be aware? For this steady impoverishment already reduces their day to day standard of living in many cases, even as it defers or ends many people's planned ability to retire, because the assumed income contained in the financial planning assumptions from years past simply hasn't been there in practice. But what people don't realize is that this steady impoverishment is entirely deliberate and that the federal government is the direct beneficiary. The nation's citizens don't realize that they are being taxed, because no one calls it a tax or overtly passes a law imposing a tax. The second half of this article can be read at the link below. Highlights include: 1) comparison of the hidden savings tax to income and social security taxes; 2) increasing costs when all debt is included; 3) the deliberate destruction of conventional financial planning strategies; and 4) further resources for understanding Financial Repression and seeking solutions.